(MENAFN - Kuwait News Agency (KUNA)) RABAT, Jan 25 (KUNA) -- Moroccan Minister of Foreign Affairs and International Cooperation Nasser Bourita received his Russian counterpart Sergei Lavrov on Friday to explore ways to promote the bilateral ties. The talks focused on the strategic vision shared by the leaders of both countries for cooperation in all areas, Bourita said at a joint press conference with Lavrov, now on an official visit to Rabat. The Moroccan-Russian relationship has gained momentum since the visit to Moscow by King Mohammad VI in March 2016, he said, commending the growing cooperation in such areas as agriculture, fishing, energy and tourism. He added that meeting with the Russian minister led to an agreement to convene an African-Russian summit this spring. 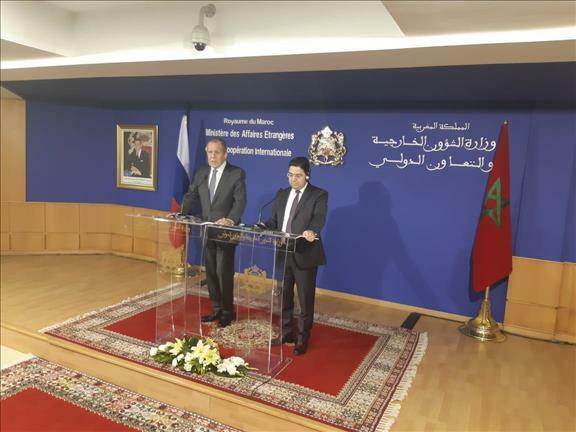 On his part, Lavrov said the Kingdom of Morocco is an important partner for Russia in Africa, voicing desire to push forward the economic, commercial and investment cooperation as per the agreement signed during Moroccan King's visit to Russia.